These are all the symbols and details off accompanying text which may appear in our 5 day forecasts. To get more detail please take account of the text desc of the weather in conjunction with the symbol. These forecasts provide a brief summary of expected conditions for the mid part of the day at Munro Level, which is 3000ft or 914m. Click on the icons to see more info from the Met Offices Weather Widget. Winterhighland's own 5-day outlooks are available on the individual snowsport area report pages. A more detailed mountain 'weather discussion' can be found on our General Situation Page. Before venturing into the mountains, we strongly recommend you consult the detailed 72 hour Forecasts from the Mountain Weather Information Service. :: What's available on this page? This Links Page was last updated and verified on Saturday 26th Feb 2010. If there are any broken links or you provide or know of a page worth including here please contact us using the details at the foot of the page. Latest Avalanche Report and forecast for the following day from the SAIS. Includes info on climbing conditions and snow distribution. Snow and Mountain sports photos and forum, plus backcountry guides. winter climbing website, with reports, photos and general information about winter climbing in the UK. Lots of links to other useful resources. Views from CML's Ptarmigan and Daylodge Webcams. One Camera at 3400ft at the foot of the Ptarmigan T-bar overlooking the Ptarmigan Bowl. Three cams at the SSC Hut at 2500ft. One looking up the White Lady, a second across to the Fiacaill. Third camera looks out over the Ski Club Hut Balcony to the Lower Slopes, good for assessing fresh snow falls and visibility. Live weather data. (Winterhighland Cam) Situated on the Boathouse at Loch Morlich, looking over the beach to CairnGorm Mountain beyond. Shows the Eastern end of the Loch, and the Windy Ridge, Coire Cas, Coire an t-Sneachda and Coire an Lochain. Useful for assessing snow level and cloud base, plus offers a wider view of the mountain. Also good for assessing low level snow in winter and beach weather in summer. .
(Winterhighland Cam) View down Grampian Road from Mountain Spirit towards the Ski Road Roundabout (out of sight). Good for assessing low level snow and road conditions, situated about 690ft. (Winterhighland Cams) Eight views of Meall a' Bhuiridh from 4 cameras, one located at the Summit at 3600ft, two at the mid station level at 2800ft and the Access Chair camera at 2200ft which offers zooms of the Flypaper, East Ridge, Spring Run, Main Basin and the Wall. Scottish Ski Club Hut cam provides views of Buachaille Etive Mor. Located on the Top Station this Web Cam offers a multitude of views of the mountain, start of the downhill bike trails and view over Loch Eil as well as a 360deg panoramic image. This camera is at a low level at Tomacharich, Fort William looking towards The Nevis Range mountains, and automatically pans between Ben Nevis and Aonach Mor. As it is distant from the mountains in low cloud or poor visibility you will not be able to see the mountains. Situated next to the Claybokie Poma this camera provides views of Butchart's Access, Claybokie, Dink Dink (useful for viewing Road Conditions), Sunnyside and a view over the Sunnyside Chair to the upper half of the Caenlochan Poma, Glas Maol top terminal just visible in the distance, plus 360deg panoramic image. (Updates every 30mins). Situated on the Snowsports School building this camera offers a range of views across the hill, plus 360deg panoramic image. Also has views of the A939 for checking the road. (Updates every 30mins). The Buachaille as viewed from the Kings House Hotel, again in low cloud you may only be able to see the trees surrounding the Hotel. Useful for assessing cloud base and snow level. Situated at Torlundy, providing a changing view of Ben Nevis and the front side of Aonach Mor. Page also contains Yad Moss snow report, webcams offline at present. Useful for finding out what's happening around Scotland, this page shows a map of all Trunk Road Matrix Signs in Scotland. Mouse over a sign icon to see the current message! View what's happening on Scotland's Trunk Roads, click on a cam icon on the Map. These cameras work 24hours a day, so are excellent for checking road conditions before heading off in the morning, and there's one at Drumochter and Slochd Summit on the A9, the Glens of Foudland on the A96, and on the A82 on the Jacksonville Straight (by the Buachaille). Details of any weather warnings, or travel disruption on the Scottish Road Network from the NADICS website at www.trafficscotland.org! Situated at the North end of Aviemore, provides weather data for 600ft ASL. Where Summit Weather Stations (AWS) give Relative Hummidity, this is a good indication of whether the summit is in cloud or is cloud free. Below 95% RH the Summit is cloud free, at 95-97% the AWS elevation is likely be around the cloud base and possibly just cloud free, above that it's a good bet the AWS is in Cloud. Located at a height of 2500ft (760m) at the Scottish Ski Club Hut near the foot of the White Lady in Coire Cas. This location is relatively sheltered, esp from winds with an Easterly vector, wind speeds elsewhere on the lower slopes can be much higher. Located at 2750ft at the Scottish Ski Club Hut adjacent to the top of the Cliffhanger Chairlift. (NEW Oct 2010) AWS situated at the edge of Rannoch Moor at 1200ft at the top end of the Glencoe Carpark. Summit Weather Station on the Summit of CairnGorm Mountain at 4084ft/1245m. Provides wind direction, mean speed and Temperature, plus RH. Summit Run AWS on Aonach Mor located at 3700ft. Provides temperature, Mean Wind Speed/Direction and RH (useful for assessing if it's in the clouds or not). See the top of this page for 5 day outlooks for the Northern Cairngorms, Southern Cairngorms and the Western Highlands. These forecasts provide a summary of expected conditions at 914m/3000ft (Munro Height) for the middle part of the day, and the expected dominant weather for the day. Please remember though that mountain conditions can change quickly, and weather can and does vary over small distances, remember altitude affects wind speeds and precipitation intensity, not just temperature. Please always consult the detailed 72hr Mountain Forecasts from the MWIS before venturing into the hills. Winterhighland's five day Mountain Forecasts are issued five days a week during the Summer, and daily during the Snowsports Season, with a short break late spring and early autumn. Unlike many forecasts available online these forecasts are not automatically generated from a single run of one computer forecasting model. Our forecasts are produced manually each day at Winterhighland HQ, taking account of how current weather patterns are developing, the output of various forecasting models and ensembles, and once completed are uploaded to the Winterhighland Server. The MWIS provides detailed 72 hour Mountain specific forecasts which are updated late afternoon for the East and West Highlands, plus the Southern Uplands seven days a week. Also forecasts for The Cumbrian Fells (updated 6 days a week), The Peak District and The Snowdonia National Park (updated 3 days a week). Forecasts funded by the Scottish Executive. The Met Office provides detailed 48hour Mountain Forecasts for the East and West Highlands of Scotland, along with the English Lake District, plus the Snowdonia National park and the Brecon Beacons. The Met Office forecasts are updated 12 hours earlier than MWIS forecasts in the early hours of the morning, thus on the day your planning a trip they provide an excellent means of checking how the day's forecast has developed overnight. Provides General forecasts for the UK, Rain Radar and webcams. Also now provides free Mountain Forecasts for Scotland. Detailed 48hour forecast issued early morning, provides opportunity to check for any overnight changes in expected weather from previous evenings MWIS forecasts. Weather forums and model data centre, lots of useful model charts and data for free. Subscription Rain Radar which provides 5minute updates, accumulative radar and postcode zoom in to any part of the UK. A long range forecasting site, the TWO forums are very useful for a source of information, but heavily weighted towards hunting for snow in Southern England at T+ 384hours!! These links below provide access to data from computer forecasting models. If it's a forecast model and there's a chart for it, there is a good chance you'll find it here. The NMM is a short range high resolution forecasting model, run once a day at midnight GMT (12z). Provides good and detailed precipitation intensity forecasts at 3hr intervals. The ultimate resource for the weather geek, charts from lots of various forecast models, as well as historical charts (great for that straw clutching pattern matching) and also the Human produced MetOffice Fax Charts are available. Latest data and charts from the GFS (+ GFS ensembles), ECMWF and UK MetO. This chart provides a 2 week insight into the probablities of different weather outcomes! 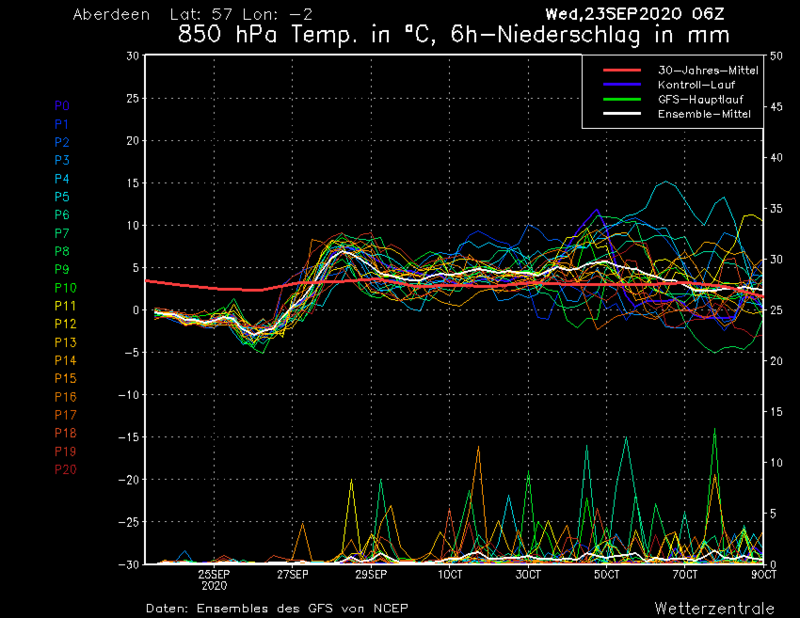 It's the output of 850hpa temperature and precipitation from the GFS ensemble set. Now we can't possibly explain about models, ensembles etc here, but in short, the 850hpa temperature on it's own can give a crude guestimate as to the 3000ft temperature, just add 3°c - Note: this is very rough, the 850hpa height can vary from under 3000ft to over 5500ft, but 4500ft is a mean value. The closer all the lines are together, the higher the confidence in the forecast. That's all for now folks. If however you know of any useful webcams or weather stations that are not on this list, please contact us and let us know. Just click on the Email Link below in the footer.